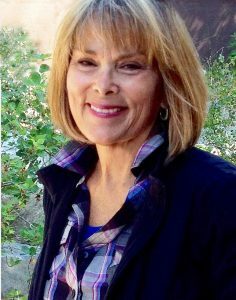 SNAG is pleased to announce that the 2018 Lifetime Achievement Award recipient is Sharon Church. Attuned to the power of adornment and its rituals, Sharon Church creates technically masterful jewels that address endurance and vulnerability. In her work, fragments of the natural world are rendered to address the beauty and impermanence within our own lives. 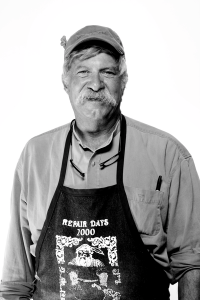 A tireless champion of the potential and value of making, Church has enriched the contemporary practice of metalsmithing by welcoming and mentoring generations of makers to take risks and forge new connections through an ancient practice. Sharon Church received a B.S. in 1970 at Skidmore College and an M.F.A. in 1973 at the School for American Craftsmen, Rochester Institute of Technology. Church grew up watching her mother doing craft work and wearing jewelry. She was inspired to take some jewelry courses in college. After working for a time as a secretary and making jewelry in the evenings at home, she pursued an M.F.A. at RIT. She is known for her exquisite carved jewelry, which incorporates materials such as bone and wood. Her work has been included in over 70 exhibitions, represented by over 20 galleries across the United States, and is found in many private and public collections. Church is now retired from teaching, having received the prestigious James Renwick Alliance Distinguished Educator Award. Between 1979 and 2014, she taught at Philadelphia’s University of the Arts, formerly the Philadelphia College of Art. She has also been an instructor at Skidmore College, Arrowmont, Penland and Haystack. SNAG is pleased to announce the 2017 Lifetime Achievement Award winner, Helen Shirk. Helen Shirk and her twin sister Judy were born in January 1942 and grew up in Buffalo, New York. Their father was a doctor serving overseas at the European front when they were born. In 1975 Helen moved to sunny southern California where she taught jewelry/metals at San Diego State University for 35 years, made metalwork in her studio, raised her son Nathaniel, and planted many hundreds of botanicals in her garden. Shirk received her undergraduate degree from Skidmore College in Saratoga Springs, New York, where she was fortunate to take classes in painting, enameling, and jewelry, taught by well-known jeweler, enamelist and painter Earl Pardon. In 1962 she had her first piece accepted to a national exhibition, Young Americans ‘62 at the Museum of Contemporary Crafts, in New York city. Shirk graduated with a Bachelor of Science degree in 1963, and spent the next year in Denmark on a Fulbright Grant that Professor Pardon had encouraged her to apply for. 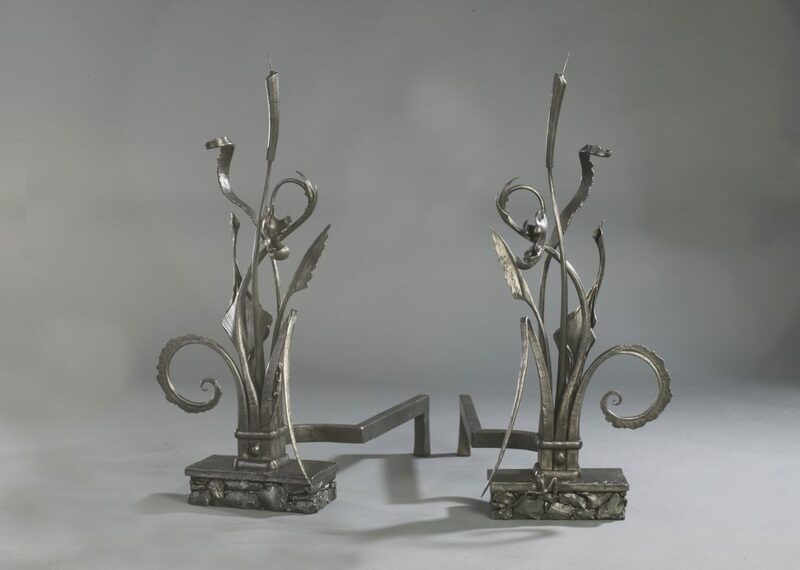 In 1967 Shirk returned to the U.S. to enter the MFA program in metalsmithing and jewelry design at Indiana University, headed by prominent jeweler and silversmith Professor Alma Eikerman. For Shirk, Eikerman was a persuasive model of an inventive, skilled artist/craftswoman, and an inspiring, demanding teacher. Shirk received her Masters of Fine Arts degree from Indiana in 1969. After teaching metalwork at IU and the Des Moines Art Center for several years, in 1975 Shirk received a faculty appointment to teach jewelry/metalwork in the School of Art and Design at San Diego State University. She set up her home studio and taught at SDSU for 35 years, retiring as Professor of Art Emeritus in 2010. During these years Shirk actively invested herself in the advancement of the SDSU metals program and its students, encouraging each student’s unique artistic voice, developing their range and expertise with traditional and contemporary metal techniques, and promoting innovation and professional excellence. 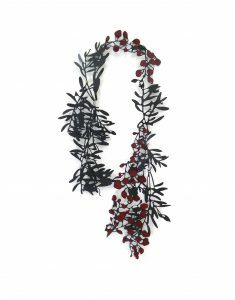 In her own studio Shirk has worked with both jewelry and object formats, exploring a broad range of materials and innovative processes to express her ideas. Her work gradually shifted from the cool sleek silver objects she made in the ’70s to a more personal approach and larger scale through the ’90s. Her Double Bowl series, begun in 1987, examines the relationship of two symmetrical parts and the unique expression of those parts within or without each other. Other works observed patterns of growth in nature, beauty and resiliency, tenuous structures, and inevitable disintegration. 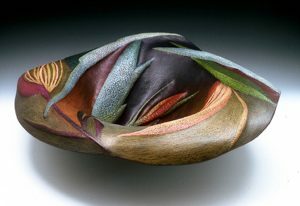 Shirk became recognized for her use of spray etching, patina, and colored pencils on large spun and hammered vessels. A later series of exuberantly colored botanical vessels reflects the lasting impact of her 1993 teaching exchange in Western Australia and the influence of her home territory of southern California. Most recently, she has returned to the intimacy of jewelry, using the strength and lightness of mild steel to create intricate ‘thickets’ for the body. Shirk received National Endowment for the Arts Craftsmen’s and Visual Artists’ Fellowships in 1978 and 1988 respectively. 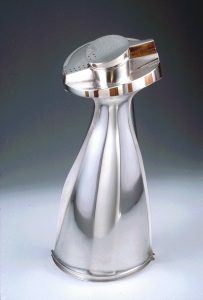 In 1989 she was named Master Metalsmith of the Year, a Distinction awarded by the National Ornamental Metals Museum, and in 1999 was honored to be designated a Fellow of the American Craft Council. Shirk’s work resides in the permanent collections of museums in the U.S. and abroad, including: The Hermitage Museum in St. Petersburg, Russia; National Gallery of Australia in Canberra, Australia; The Renwick Gallery, Smithsonian Institution in Washington, D.C; Cooper-Hewitt National Design Museum in New York, NY; the Victoria and Albert Museum in London, England; National Museum of Modern Art in Kyoto, Japan; the Schmuckmuseum in Pforzheim, Germany; the Museo Del Gioiello in Vicenza, Italy; Los Angeles County Museum of Art in Los Angeles, CA; the Helen Drutt Collection at Huston Museum of Fine Arts in Houston, TX; the Oakland Museum in Oakland, CA; the Mint Museum of Craft and Design in Charlotte, NC; the Philadelphia Museum of Art in Philadelphia, PA; the Contemporary Museum in Honolulu, HI; the Museum of Art and Design in New York, NY; the Memphis Brooks Museum of Art in Memphis, TN; the Indianapolis Museum of Art in Indianapolis, IN; the Carnegie Museum of Art in Pittsburgh, PA; the Museum of Fine Arts in Boston, MA; and the Minnesota Museum of Art in St. Paul, MN. 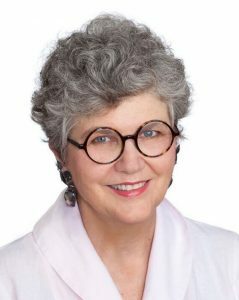 The 2017 SNAG NEXUS: A Connection of Ideas conference will be dedicated to Helen Shirk and she will receive her award during the opening remarks in New Orleans, Louisiana on Wednesday, May 24th, 2017.